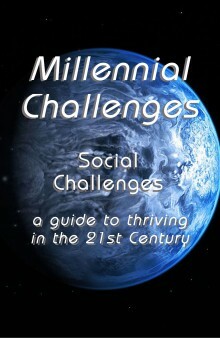 Following are excerpts from each of the ten chapters in this book. To read the entire text, add it to your shopping cart by clicking on the link below. Now that we have explored the personal challenges associated with the new millennium, we have a solid foundation upon which to build a consistent view of those concepts applied to our interpersonal relationships. These social challenges, like their personal counterparts, will be different in the twenty-first century and beyond than they have ever before been. The next ten chapters examine some of the most important areas in which we will all need to be focused in the years to come. We will begin with the most basic of them and build on that foundation. If you ask most people about trust in their lives, they will automatically assume that you are talking about their trust of other people, or people’s trust of each other in general. On the surface that seems to make a lot of sense. However, if we look a little deeper, another facet emerges that changes the entire picture. Put simply, the limit of trust in your life is your trust in yourself. If you trust yourself, you will find it easy to trust others. If you do not trust yourself, then trust in others will be difficult and uncertain. This may seem a bit absurd, but bear with me, and you will see that it isn’t. Cooperation multiplies the value of individual effort, and in so doing, empowers us all. Competition has long been revered, at least in our capitalistic society. The mere mention of the word has been known to bring tears to the eyes of captains of industry and athletes, among others. Many believe that whatever we have that is of value we owe to the blessings of competition. What is methodically overlooked is the cooperation that inevitably accompanies all competition. Three thousand generations ago, more or less, homo sapiens began their trek out of Africa and into virtually every nook and cranny of this good Earth. The majority of this dispersion was largely completed about 500 generations ago. Today there are few areas where humans do not live. For nearly all of this time, the geographical range of interaction between people and groups of people was severely limited. We simply didn’t have the means of traveling, or even communicating, over large distances easily. In fact, even in America, prior to the last century most people never traveled more than a few dozen miles from their birthplace. The technology of the twenty-first century has introduced new opportunities to nearly every living human, that are so dramatically different than anything we have ever experienced before that whole libraries of books could be written to describe the changes. Be aware that saying “nearly every living human” is not an exaggeration. To illustrate, consider that, as mentioned earlier, a recently announced United Nations study has determined that (at the time of this writing) over six billion humans regularly use mobile communication devices; that is, cell phones and tablet computers. That amounts to around 85 percent of all of the people on this planet. And that number is still growing. Who knows where it will be by the time you read these words. Each culture—past, present and future—is a treasure trove. If we are wise, we will share freely. Culture is often viewed as being composed of art, customs, and mores of a group of people, and indeed it does pertain to those attributes. But culture is far more than just a set of customs and habits. In its largest sense, it is nothing less than a worldview shared by one or more people. Yes, one or more, because there is such a thing as a culture of one. In fact, ultimately, since none of us shares precisely the same view of life, the Universe, and everything as any other person, we all live in a culture of one. Art can be culturally neutral, so it offers ways to share our inner experience freely. Music is ideal. Creativity in general, and art in particular, is how human beings express their inner experience and true being in external forms. It is on one hand a way of exposing the artist’s unique point of view, and at the same time a means of communicating that which he or she most wants to share. No two creative acts are identical, because no two artists are identical. For that matter, no artist is exactly and entirely the same from one moment to the next. This constant spontaneity and unpredictability is one reason why we are so drawn to artistic creations. In the industrial revolution, people moved to the cities. Technology now allows us to reverse that. Physical travel and transport is becoming less and less essential. This opens new doors. Why do people live where they do? There are several factors that tend to form a hierarchy. First among them is survival. In the ancient world, it was the availability of game and edible vegetation. Later this was replaced by land that was suitable for agriculture and livestock. In the last couple of centuries there has been a movement toward urbanization, which is just another form of survival. In this case, however, it is about the availability of jobs. Regardless, the opportunities available in a particular place have always been the number one criterion for choosing a place to live. All other reasons come in a distant second or lower. Since time immemorial people have had to physically move themselves or their possessions from place to place. The means at their disposal didn’t change much for hundreds, even thousands of years at a stretch. The first really big change occurred in the nineteenth-century with the advent of steam power. Suddenly, steam ships and railroads changed the whole transportation landscape. No longer was the horse the fastest means of locomotion available on land, nor the wind on water. Though it’s hard to grasp, biologically modern humans lived for hundreds of generations before the concept of recreation as we know it began to emerge, because they were too busy with their struggle for survival. It wasn’t until humanity gave up their nomadic hunter/gatherer lifestyle in favor of an agrarian one that there was time left over to play, which in turn begged the question of what to do with that spare time. That’s when recreation was born. The main theme of this book is that constantly accelerating change is the most prominent characteristic and challenging facet of this century. Few subjects covered in this book are better examples of this than the gravitation toward extremes that is already evident. One of the most obvious examples of this trend is found in extreme sports (a.k.a. action sports, aggro sports, adventure sports). What more powerful expression of a psycho-social emergence could there be than one in which millions of people freely and voluntarily risk their lives for no purpose other than the thrill of the experience itself? And that is precisely what extreme sports are about. To purchase and read this book now click here.